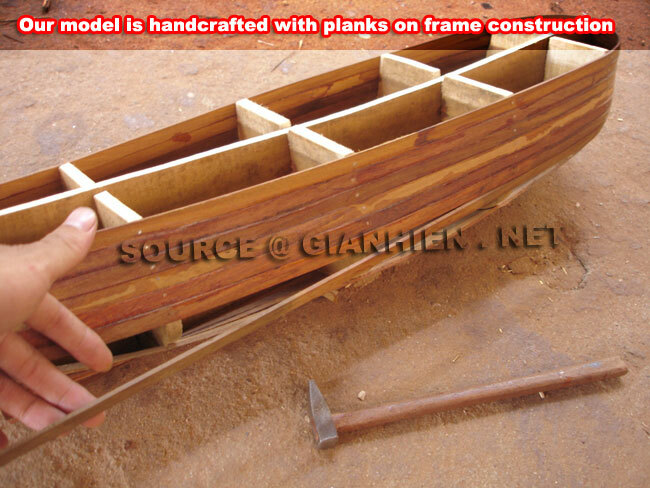 Model is handcrafted from hard wood with planks on frame construction. 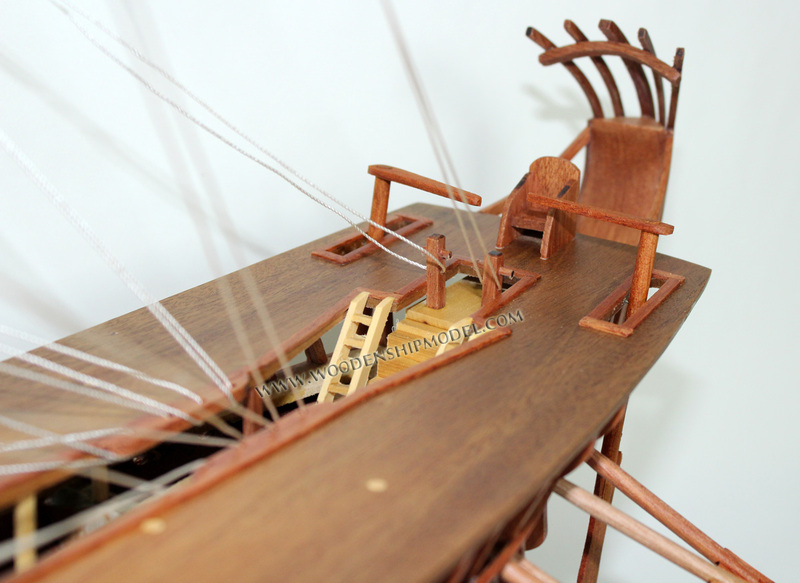 Model comes with a display base, a brass nameplate and all the oars. 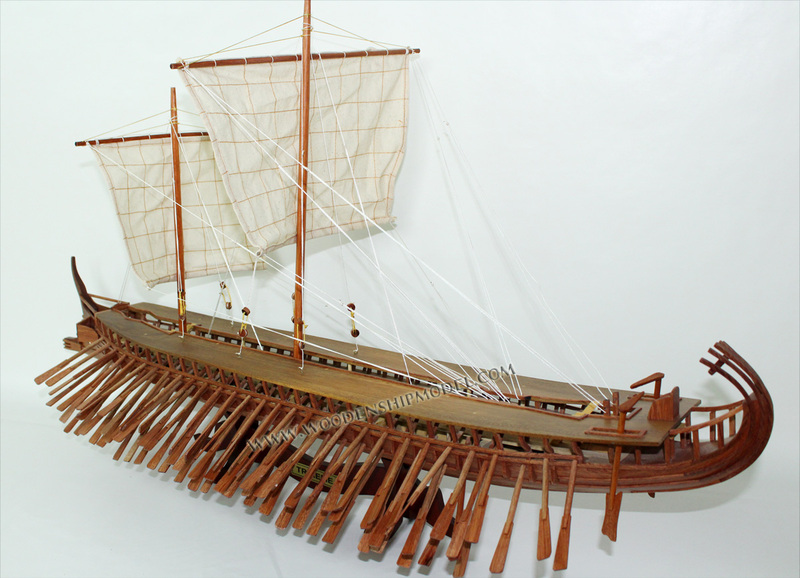 Trireme was a warship, that many times people used it as cargo ship as well. It was a very weightless ship. 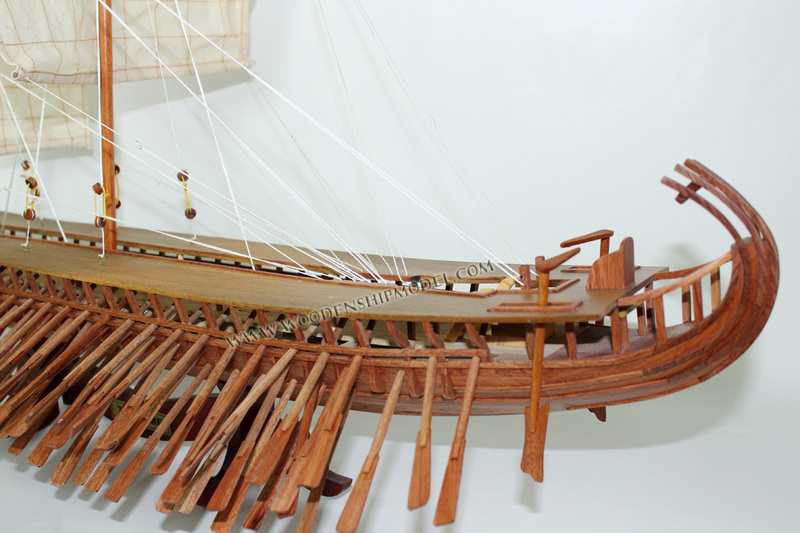 The ingenuity of this ship was that it gathered more oarsmen, in contradiction with the other ships of that period, having as a result to increase its propulsive strength, without proportionally having to increase its length. 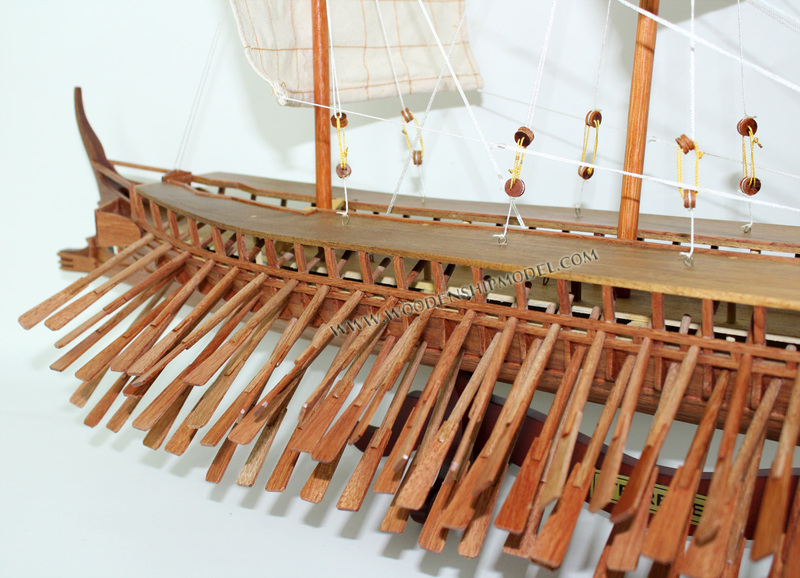 This was accomplished by putting the oarsmen in three overlying or successive series, instead of one, like happened with triakontorous and pentikontorous. 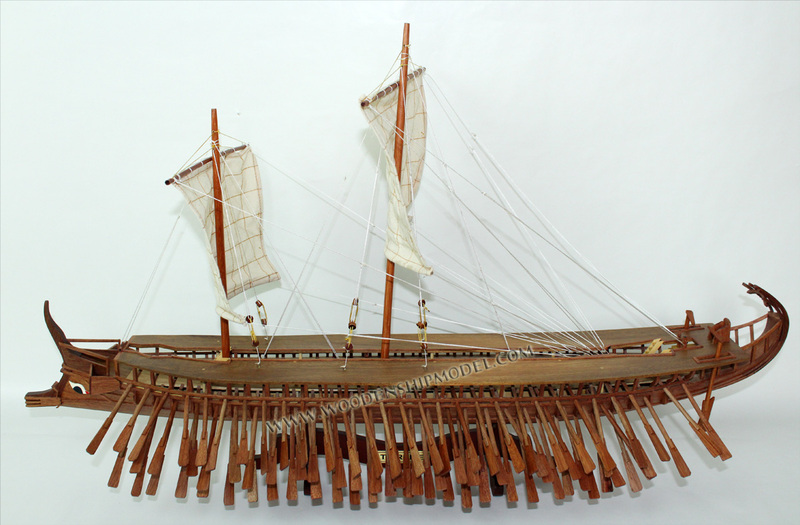 The ship’s draught (from the water-line to the keel) was minimum so it could move with comfort to the shallow while at the same time it could hauled up the beach every night. Its shape, which was long and thin (35-40 m on 6 m approximately), enabled it to sail at 6 knots an hour (1 knot= 1852 m) and be agile. 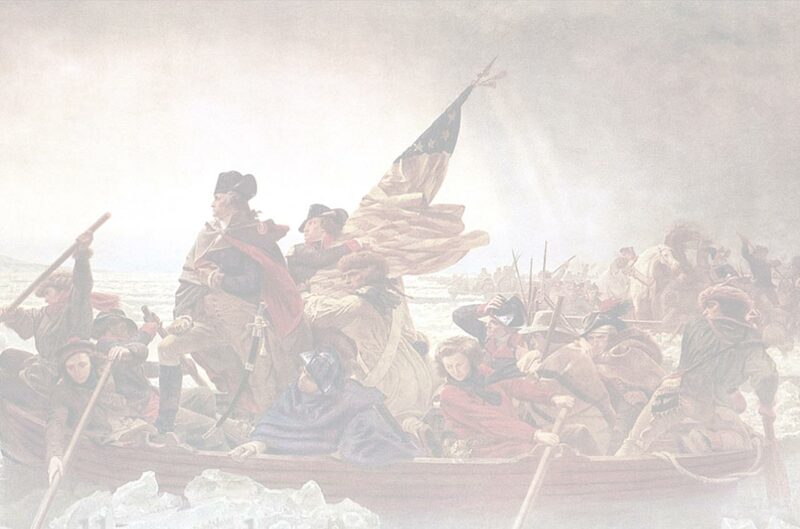 The crew was consisted of 200 men: the Captain, 10 dignitaries, 2 archers-bowmen, 14 soldiers, and 170 oarsmen. 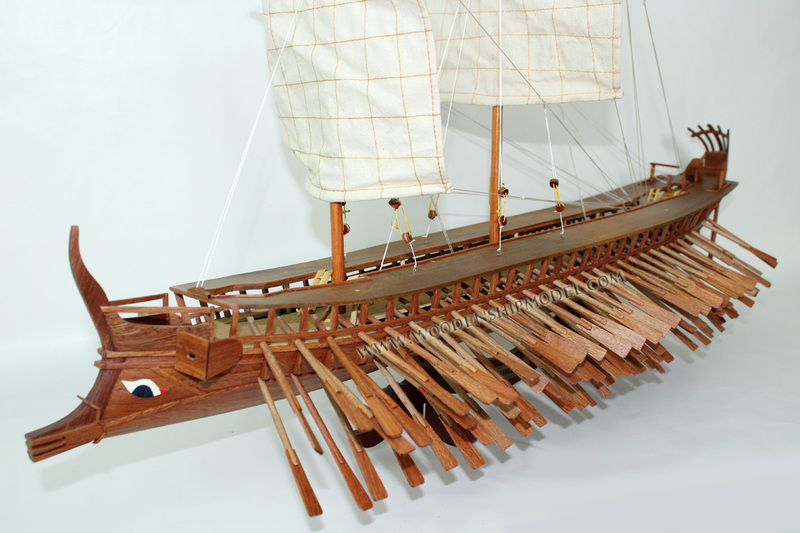 It is calculated that the bireme’s weight along with the crew, was 50 tones, as the ballast’s weight, which helped to the balance of the ship. The basic moves inside the ship were the rowing, the rise, and the taking down the sail, the weigh or the drop of the anchor with a special team-composed with a few people-just in case. Essential, of course, like the others, but more impressive was the regulation of the rowing. That happened from the petty officer commander of the heretic, which gave the order for the setting off and the pause. One ore two flute-players helped him out, that were named triravloi keeping the rhythm with the flute or the chant. 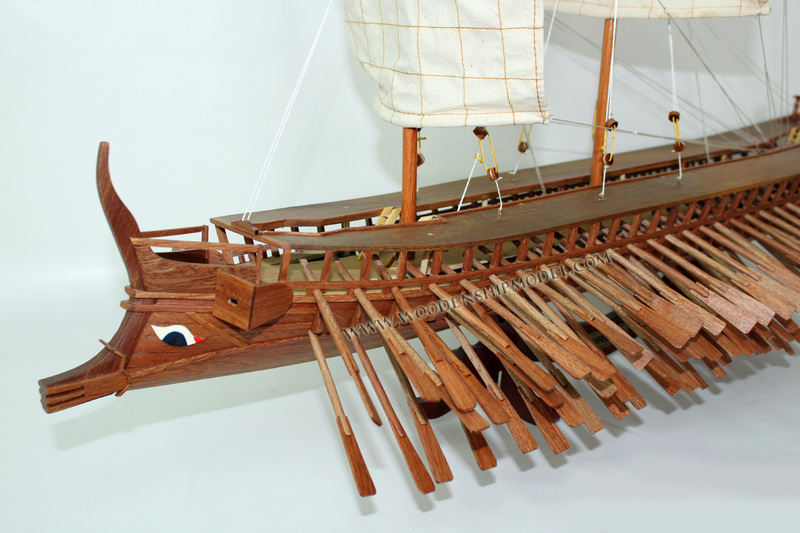 In some cases, in view of the enemy, the flute-players were using one pair of stone krotala so that the orders were not confused neither with the petty officer’s orders nor with the voice chanting or the sound of the flutes. 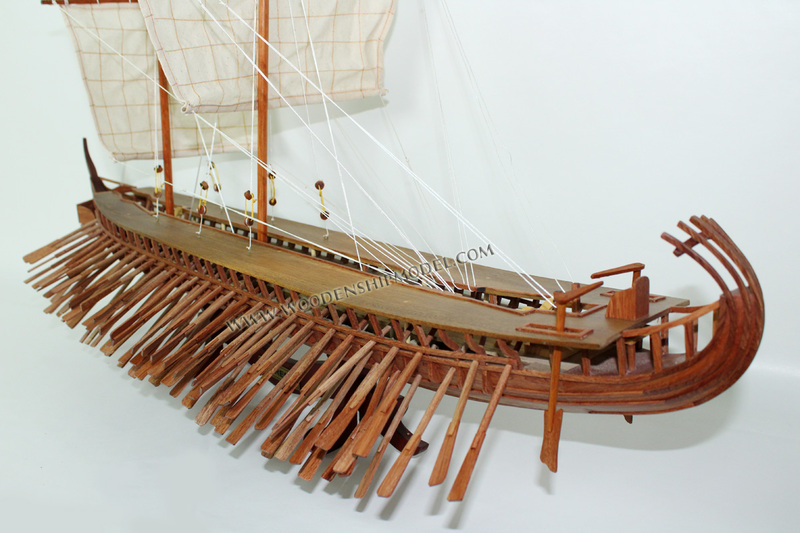 The trireme ship was made of fir-tree, so that the ship could be light. The keel, though, the beam that reaches - from stem to stern, the “vertebral column of the ship”, it was made of oak so it could last longer. The mast that supported the square-shaped cloth, it was lowered at the bridge when the ship fell foul of with other enemy ships. 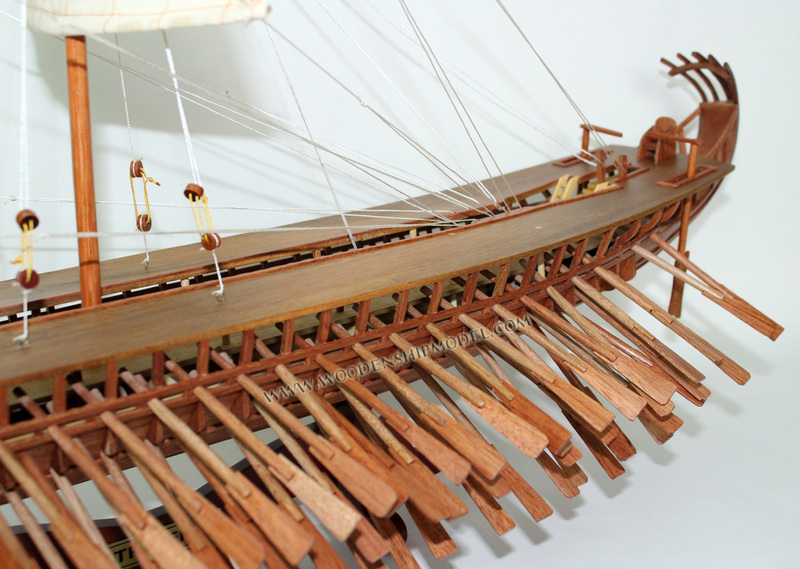 The ropes that held the mast were made of cannabis or papyrus and were spread with tar, so they will not easily rot, while pieces of skin ensured the water-tightness in various parts of the ship. 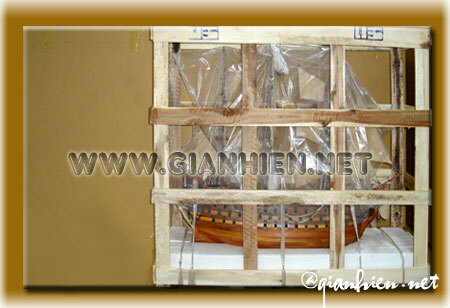 In each side of the stern there were to oars-helms, which were used to give the correct direction to the ship. 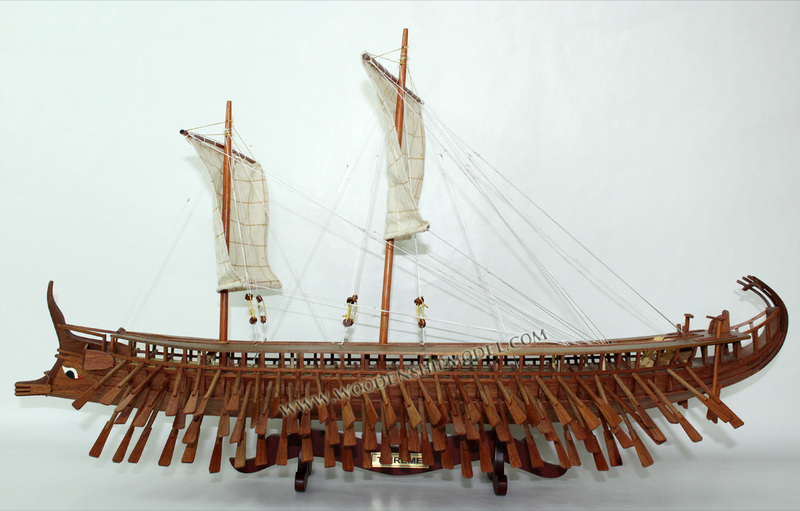 The stern ended to the akrostolio, decorative element with 4 or 5 curved axis, like a fan. 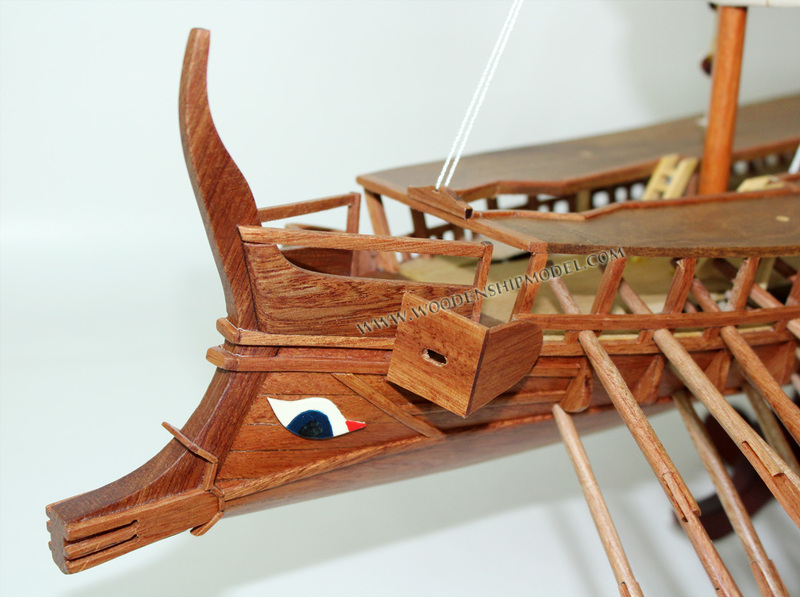 The ancients wanted the ship to look like a sea monster. The akrostolio was the tail that came out of the sea. At the bow it was painted an eye, with symbolic meaning. It protected the course and kept away the bad spirits, which could put into danger the voyage, little further a bronze ram stuck out of the anterior part as a strengthening of the bow. 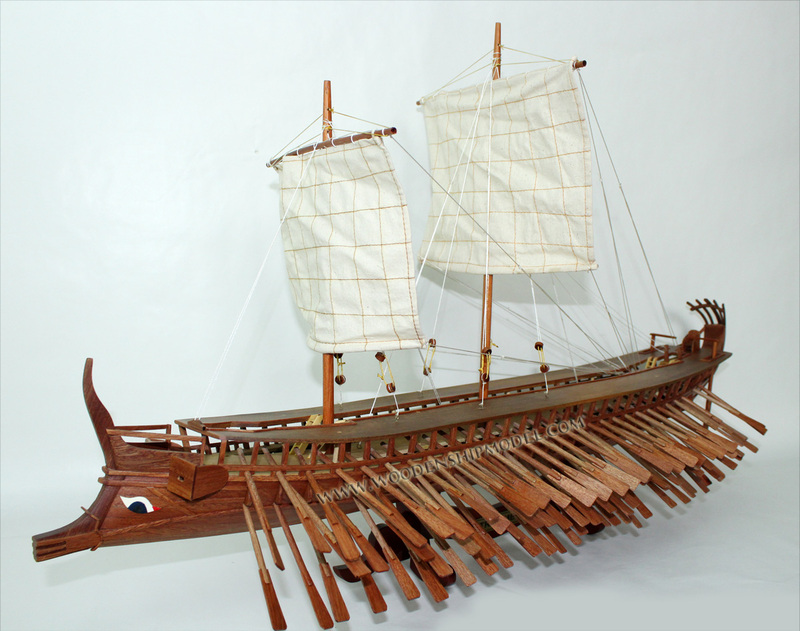 It was used to cause breaches to enemy ships in naval battles, breaches that usually turned out to be fatal.